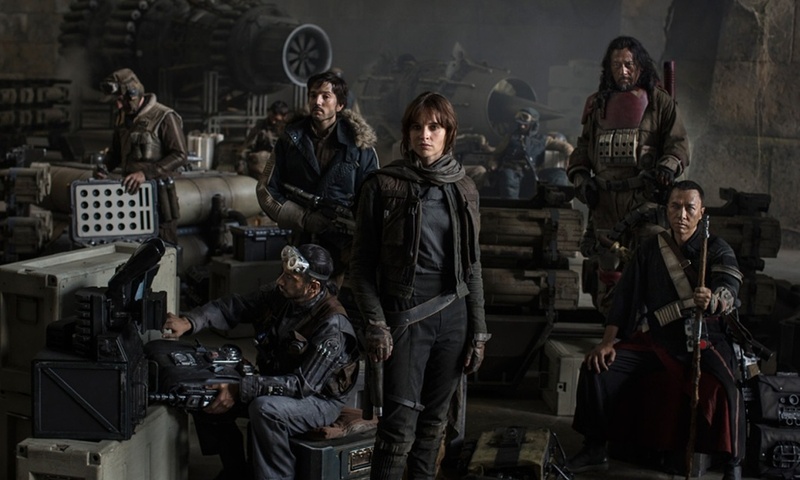 This December, Lucasfilm is set to release the first Star Wars film outside of the traditional numbered films with Rogue One: A Star Wars Story. The film is the first in a new series of stand alone films, known as the Star Wars: Anthology series, and will tell the story of how a group of Rebels stole the plans to the first Death Star. Little is known about this group, however our friends at MakingStarWars.net have heard some new details about the characters and what they will be doing in the film. As usual, there is a chance this may not be accurate however if you are trying to avoid all Rogue One spoilers then stop reading now. This is your SPOILER ALERT! Apparently there’s a sequence in the film where Felicity Jones and Diego Luna go into disguise. It sounds a little like A New Hope, right? There’s a slight difference; they’re not Stormtroopers. In the film she dresses up as a Imperial Gunner. Diego Luna’s character doesn’t, instead he goes for a higher commanding station and dresses up as an Imperial Commander. It sounds a little like some A New Hope hijinks in a way. With the more serious nature of this film, I do wonder if it will be a bit more tactical than sneaking around a battle station. Gareth Edwards did make it abundantly clear to us at Celebration that A New Hope is his favorite Star Wars film. Alan Tudyk’s character has been described to me as a more than a droid. He’s a commando droid and he looks really cool. Details are being withheld for now and I wish I knew more about him. Felicity Jones’ character is codenamed Green Seal Leader by the production. Seal Communicator Blue is Jiang Wen’s character (the guy with the red armor on behind Donnie Yen in the cast photo). Eel Commander is Forest Whitaker’s character. This faction destination has led me to speculate he’s a bounty hunter affiliated character. Seal Droid is Alan Tudyk’s character. The bad guys have codenames related to sharks. The factions when coded amount to seals, eels, and sharks. The reports of Alan Tudyk playing some sort of Droid line up with previous rumors and the fact that Tudyk is playing a motion-capture character. It will be interesting to see how a mo-cap droid looks as I believe this is the first time there has been one in Star Wars. Also, based on what we know, the codenames mean Seals are Rebels, Eels are Bounty Hunters, and Sharks are the Empire. There is a bad guy or person of some importance to the Empire. His main feature is a huge majestic white cape with a slit in the back. In the film there is a beautiful shot of this Imperial treading through a shallow body of water with said cape trailing him. The figure that wears it appears to be an older male. I’m told he has a badass sidearm and a really cool name. We’re fairly certain this is Ben Mendelshon’s character but that’s not 100% or verified at this time. Another shot shows him walking through legions of Stormtroopers and other Imperials. The shot was described as harkening back to the shots in Return of the Jedi where Darth Vader and the Emperor meet. Supposedly the cape looks really neat and is rather impressive. It isn’t Mads Mikkelsen by the sound of things. Mikkelsen wears earth tones in terms of his costume. There’s a shot of him in an impressive golden colored field. So by the sound of things, he isn’t the guy in the white cape unless he loses it later on in the film or something like that. But hey, we can at least place him in a setting now. This does line up with the reports that Mendelsohn is playing the villain in the film and that Mikkelsen is most definitely not. The idea of a villain in a cape sounds interesting, my only concern is that it's not like the Empire to let someone make adjustments to their uniform (assuming he's an Imperial and not someone hired by the Empire to hunt down this Rebel cell). I get more excited for this by the day.